Korean Air has signed an order for up to 20 Boeing 787 Dreamliners in a deal worth approximately $2.6 billion at list prices. The agreement involves 10 firm orders and options for 10 additional 787s. Delivery of the 787-8 airplanes will begin in 2009 and extend through 2011. Following a signing of the contract in Seoul on April 11, Korean Air Chairman and Chief Executive Officer Yang Ho-cho said: "This airplane deal signifies our commitment to our vision of becoming one of the world's top 10 airlines by 2010." He said that it exemplifies Korean Air's long-range planning to ensure its capabilities to meet future competition and market demand while also being more cost efficient. 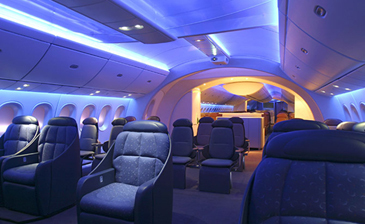 The B787 aircraft, which is configured to accommodate between 217 and 257 passengers with 217 to 257 passenger seats, is made of composite materials instead of the aluminum normally used to manufacture aircraft. The materials reduce the plane's fuel by 20 percent and maintenance costs by 30 percent. Korean Air plans to put the aircraft into air routes in the United States and Europe. Korean Air Takes Off Daily to Hainan in Dec.